Sadly, the freeze/frost event in late May hurt about 60% of our early variety berries, but we are pleased with how the middle and late berries are coming with so many blossom and berries! So U-Pick will open when the later berries come in to ensure you have a great picking experience. Our best guess is that U-PIck strawberries would be ready the week of June 12th. We recommend you check back around June 5th for an update. Depending on the weather, we may have some of the early berries already picked for sale on the market this coming week. Yes, we understand everyone is anxious for a Michigan strawberry….they are coming! Asparagus: We have plenty of asparagus now, this is the time to can, freeze, or simply get a lot to enjoy. It will only last a few more weeks…pricing is the same as last year: $2.25 a pound, 10# or more in bulk, goes to $2.00 a pound. If you want to call and place an order for a large quantity, call us at 269-244-5690, but we have plenty on hand. Bedding plants: All of the plants that we will have for the year are here now! Yes, it is time to get your gardens finished….or for some of you, started! Memorial Day has always served as a marker for when gardens and flower beds should be planted and finished. Cold-loving vegetables: cabbage, kale, brussels sprouts, various lettuce varieties, broccoli, chard, and spinach. Flower annuals: We have a huge selection of flower annuals….too many to list! Tomato plants: We have a large selection of tomatoes (all the ones that we grow here in our own fields) and mini tomatoes like grape and cherry. Organic Produce: Lettuce, spinach, kale and carrots, grown in our organically certified hoophouse and at our organic schoolhouse garden. Look for the bright organic sign located by the market cooler where we keep this produce fresh. Bread: Whole Wheat, Cinnamon, Italian, Whole Grain, and Tuscan, as well as Hamburger Buns and Hot Dog Buns. We are partnering again with La Brea bakery this year and will have the following breads: Semolina Cheese, Roasted Garlic Loaf, and Jalapeño Cheese. The popular Vegetable Bread returns this weekend! Cupcakes: Coca-Cola chocolate cupcakes and vanilla cupcakes are back! Brandy tasting and tours returns this Saturday with Bruce from 1 – 3 in the brandy room. New this year are cider tastings. From 4-6 on Fridays and 3-6 on Saturdays, join Becca at the market for hard cider happy hour. We’ll be doing bottle pours and have many of our ciders on tap for flights and growler fills as well. We’re really excited to be doing more tastings this year as well as provide a nice space at the market for our customers to have a drink and pleasant conversation. Of course, we are a small family market so bear with us as we try and figure out the best way to do this and keep the atmosphere you know and love! We look forward to seeing you. The greenhouse tomatoes and cucumbers are ripening slowly (code for please send the sun)….they will go fast, we picked one half bushel for our first picking this week! We planted our vine crops of cucumbers, squash, melons and such. Good to finally get everything in the ground. If you were driving by you saw us painting our peach trees trunks.Many of you have asked why we do this. Painting fruit tree trunks with white latex paint can prevent the bark from splitting and cracking off. Splitting can happen when the tree is exposed to freezing evening temperatures, followed by a daytime thawing (as you know a fairly common occurrence in this state!!). The painted white trunk helps reflect sunlight during the daytime hours and keep the tree warmer at night. It also helps protect against rodent damage, mice and voles can girdle a tree under the snow cover. Even better, we have found that rabbits don’t like the taste of paint. Check out the antique blacksmith’s table in the center of the market for lots of information about what is going on here locally and in Michigan. We encourage you to discover some of the many treasures we have here in St. Joseph County. We will try to highlight some of our favorites for you as the year goes on. This week, the 2017 Michigan Farm Fun directories came. These are a “must have” for your vehicle glove box in order to visit the many wonderful farms in your travels around the state. Thanks as always for buying local, from everyone at Corey Lake Orchards. We hope everyone has a pleasant and safe weekend, and if you are traveling in for the weekend, bring the sun with you, please! 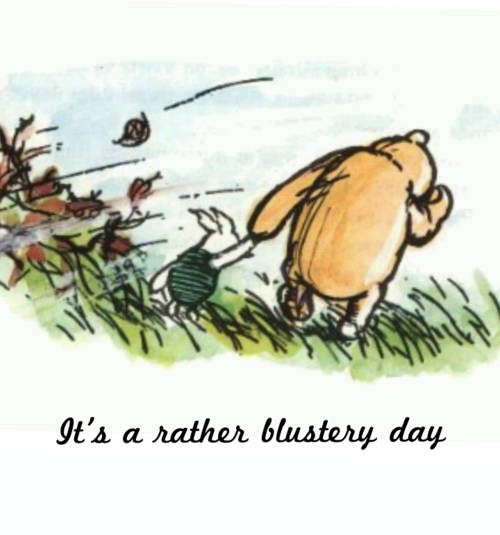 One of my boys’ favorite books was Winnie the Pooh and the Blustery Day. When the movie came out, that was even better….watching poor Pooh try to open the door to his house and have all of his furniture blow across the room! And so it seems like we have been trapped in a Winnie the Pooh story here for about 3 days now—with the kind of wind gusts that cause us to look out and see if the hoophouse is still here and to make sure our tomato plants haven’t been blown out of the ground! The heat on top of the wind made us yearn to have our real spring back. And on one of these blustery days this week, beekeeper sister Charlotte, along with husband Marshall, relocated bees from the local Fabius Township Hall to our farm. The article here is an interesting read: http://www.threeriversnews.com/local-news/honey-please-bee-serious. So if Winnie the Pooh comes out of the woods, we hopefully will have lots of honey! Asparagus: Pricing is the same as last year: $2.25 a pound, 10# or more in bulk, goes to $2.00 a pound. If you want to call and place an order, we’ll call you back when we can fill larger quantities. 269-244-5690. We have plenty of asparagus now with this heat. This is the time to can, freeze, or simply get a lot to enjoy. Rhubarb is ready! Available now for $2.50 a pound. If you need 10 pounds or more, please call us to order and we’ll get it picked and ready. 269-244-5690. Bedding plants: Our last group of plants arrives late tomorrow, so everything will be here. Cold Crop: cabbage, kale, brussels sprouts, various lettuce varieties, broccoli, chard, and spinach. Tomato plants: We have a large selection of tomatoes (all the ones that we grow here in our own fields) plus 4 heirloom varieties and mini tomatoes like grape and cherry. Other “heat loving” vegetable plants like peppers, cucumbers, melons, squash, eggplant will be arriving late Friday, May 19th. Hanging Flower Baskets: We have lots of hanging baskets, including some of the favorites we carry every year. Organic Produce: Lettuce, spinach, kale and carrots, grown in our organically certified hoophouse and at our organic schoolhouse garden. Bakery Update: If you would like us to save something for you feel free to call us at 269-244-5690 and we will gladly set it back for you! If you are running in to get your soccer game treats, call us ahead and we will have it boxed and ready for you. Slushies — especially in this heat! Alcohol offerings: We have our full range of brandy for sale. We also have cherry wine, as well as: Strawberry Cider (the 2017 edition of the cider many of you liked last year), Sweet Cider, Ginger Cider, Dry Cider, Hometown Hero, and our Brunch Cider, a new cider made with vanilla and Michigan maple syrup. Check our new sign made by local artist Cathy Bingamon (thanks, Cathy!) In next week’s update we’ll announce when we will be starting up our tours and tastings and other things we’ll be doing this year! Local Products: We try to offer as many local and Michigan made products as we can. Our market is beginning to fill out with some of these and you’ll find them in the cooler, to the bakery to around on various shelves and the wall. We watered, watered and watered. Then as the blustery wind dried everything out, we watered again. Our plants, trees, hoophouse and greenhouse were NOT happy with 86 degree days in May! Everyone was put to work watering! But….the greenhouse tomatoes finally got the heat they needed to start turning red….yes….they are coming, hopefully we’ll have a counter full on Memorial Day weekend. Hooray! We picked so much asparagus (which can grow an inch an hour in this heat) that on same days we ran out of picking containers! We got several thousand tomato plants in the ground, including the u-pick tomato field planted, with all of your favorite varieties. We were truly happy to see all of our customers back in the past several weeks. You will never know how much it meant to all of us when you told us how much you missed us over the winter! And as we saw folks carrying out out 3 loaves of cinnamon swirl bread they had missed for months, stocking back up on cider and cherry wine, grabbing bags of fresh spinach and lettuce as fast as we could make them up because you missed fresh vegetables, we were once again reminded that what we do is treasured as much as we treasure our customers. Thanks as always for buying local, from everyone at Corey Lake Orchards. Update: baby robins cracked out of their shells on Mother’s Day! Here’s wishing a Happy Mother’s Day to all those whom we call mothers. If you are out this weekend, please stop into our bakery where every mom gets a free cake donut of their choice, as our acknowledgement and appreciation of how special you are. Asparagus: Pricing is the same as last year: $2.25 a pound, 10# or more in bulk, goes to $2.00 a pound. If you want to call and place an order, we’ll call you back when we can fill larger quantities. 269-244-5690. We apologize, but the cold weather has continued to slow the growth of asparagus and we are trying to keep up with demand. For those who have placed an order, we hope to start filling them this coming week. As always, it is best to call before you come out to make sure we have some. 269-244-5690 – we can definitely put back an order for you too. As soon as it gets warm and STAYS warm…..we should have plenty. Thanks to Teri for getting all of our flowers ordered and organized! Tomato plants: Our tomato plants are here, we’d recommend you let them stay outside and “harden up” before you plant them. We have a large selection of tomatoes (all the ones that we grow here in our own fields) plus 4 heirloom varieties and mini tomatoes like grape and cherry. Herbs: We have almost any herb you are looking for. Other “heat loving” vegetable plants like peppers, cucumbers, melons, squash, eggplant, will be coming next week. It is a touch too early to plant these given some of the cold nights but they will be here! Hanging Flower Baskets: We have lots of hanging baskets, including some of the favorites we carry every year, like the lipstick plant. Touch the flowers when you are here on these, so soft and fuzzy. Organic Produce: Lettuce, spinach, kale and carrots, grown in our organically certified hoophouse. As we finish harvesting winter crops from the hoophouse and start harvesting spring crops from the schoolhouse (and cope with the spring bunny population), we might be short on kale and lettuce! It might be a good time to buy one of our lettuce bowls—you can pick your lettuce for a fresh salad and it will grow back. We should have plenty of lettuce again next week, and field kale is slowly coming in now too. Bakery Update: We look forward to seeing you this weekend! If you would like us to save something for you feel free to call us at 269-244-5690 and we will gladly set it back for you! If you are running in to get your soccer game treats, call us ahead and we will have it boxed and ready for you. Slushies will be back starting this weekend! Seeking a gift inspired by nature? Check out the ceramic work by Mollie whose whimsical bowls were in the market last season. This year we also have single stem flowers for hanging that will serve as a lasting reminder of your thoughtfulness. For Mother’s Day (and for any day that you need a gift) Peggy is happy to help make a basket up for you, starting at $10 and adding in what you want. So whether you choose plants, market produce, baked goods, adult beverages, local condiments of honey, maple syrup, or spicy mustard or one of our select gift items, a basket can be the perfect present. We at Corey Lake enjoy working with you to share the gifts that celebrate the seasons of life. Call and talk to Peggy, or leave a message for her to call you back, and she will create just what you need in the price range you desire (269-244-5690). Saturday we planted more heirloom apple trees with great hard cider varieties….and we’re going to work harder to outsmart the deer this year. We’re excited to have these grow up and bear fruit and use them in our cidery. We began putting things back in our play area this week. The slide, swings, corn box and other games are there for young people to enjoy. But, we need your help to make sure there is an adult who can watch over those playing, for their safety and others around them. Please make sure you’re at your child’s side as they enjoy our play area. Thanks! Who’s ready for a greenhouse tomato? Everyone except the tomatoes apparently. We have beautiful green tomatoes and if we could get some sun—they will turn red. Looks like they are a few more weeks out. This was a particularly hard week for us and all Michigan farmers with the frost/freeze that occurred this past weekend. While we suffered some damage to several of our fruit crops, it was quite limited and we feel very fortunate as we learn that those farms further north suffered more extensive damage. While walking through the vineyards on Monday checking for frost damage, I came across this, which once again reminded me how fortunate we are as farmers to work the land, while taking in the joys one finds along the day. Happy Mother’s Day to all and thanks for everyone for buying local. We’re ready with asparagus, fresh greens, baked goods and more! We are officially open for the 2017 season now, including our bakery! Our hours are 8 am to 6 pm, 7 days a week, including holidays! Asparagus pricing is the same as last year: $2.25 a pound, 10# or more in bulk, goes to $2.00 a pound. If you want to call and place an order, we’ll call you back when we can fill larger quantities. 269-244-5690. The cold weather has slowed the growth of asparagus and we are trying to keep up with demand. As always, it is best to call before you come out to make sure we have some. 269-244-5690 – we can definitely put back an order for you too. As soon as it gets warm and STAYS warm…..we should be rolling in it. See one of our favorite recipes at the end of this post. You can find our asparagus at Appoloni’s Three Rivers and Corey Lake locations on pizza or in their amazing chicken alfredo pasta , as well as at the Riviera Theatre in Three Rivers. Bedding plants: We have all of our “cold crop” plants available for sale, which you can plant in your garden now. These include: cabbage, kale, brussels sprouts, various lettuce varieties, broccoli, chard, and spinach. We also have a few seed potatoes and onion sets for sale. We also have a good variety of flower annuals in, and will continue to get more. If there is something you are looking for (like an entire flat of a certain flower,) if you let us know, we can make sure to have that for you. We hope to start getting our other vegetable and tomato plants in next week if it warms up. Reminder, it is too cold to plant these yet. Bakery Update: Hooray, we are very excited to be open for the season! We have baked some of your favorite items along with some new items for you to try this weekend. As the season goes on, we’ll be making additional items that we think you will love. We look forward to seeing you this weekend! If you would like us to save something for you feel free to call us at 269-244-5690 and we will gladly set it back for you! Cookies: Cut Out Sugar, Monster (chocolate chips, M&M’s peanut butter and oatmeal), Iced Lemon, Peanut Butter, Ginger Molasses, Smores, and Cherry White Chocolate Chip. Pies: Apple, Blueberry, Cherry, Peach, Strawberry Rhubarb and Rhubarb. Bread: Whole Wheat, Cinnamon, Italian, Whole Grain, and Tuscan, as well as Hamburger Buns and Hot Dog Buns. We are partnering again with La Brea bakery this year and will have the following breads: Semolina Cheese, Roasted Garlic Loaf, and Jalapeño Cheese. Muffins: Banana Nut, Blueberry, Lemon Poppyseed, Pistachio, and Strawberry. Donuts: We will have our Blueberry, Buttermilk, and Cherry cake donuts available Friday, Saturday, and Sunday. We will also have Cherry Fritters, Vanilla Fluff Longjohns, Yeast Twists, Bavarian Cream (Custard) Longjohns, Raspberry Bismarks, and Yeast Rings (Available all week). Emma Grace was happy to taste test the first cookies out of the oven made by her mother and grandmother! Alcohol offerings: We have our full range of brandy for sale. We also have cherry wine, as well as: Strawberry Cider (the 2017 edition of the cider many of you liked last year), Sweet Cider, Ginger Cider, Dry Cider, Hometown Hero, and our Brunch Cider, a new cider! Made with vanilla and Michigan maple syrup. If you are fixing breakfast for Mother’s Day, try this! Currently on tap at The Local in Centreville and also being poured at The Riviera in Three Rivers and the Appoloni’s by Corey Lake. Brandy room tours and tastings won’t be available for a few weeks. Check back as we get everything together for the year. Local Meat: We are starting our second season partnering with Mill Lake Farms, a local farm in Cassopolis who will be bringing in a variety of beef and pork cuts–all done naturally. This means hormone and antibiotic free, no use of pesticides or chemicals on their farm, open pastures, grass-fed, non-GMO grains and hay. They believe these practices result in the meat being the very best quality available, without sacrificing flavor or tenderness. They are looking forward to having you try their meats and welcome your feedback. Please read more about them here: http://www.coreylakeorchards.com/other-products/mill-lake-farm-meats/. Look for these in our bakery freezer. We shivered and donned rain gear for a good part of the week, the same as anyone else in our Pure Michigan weather. When the weather gave us a break—we were excited to get some new trees planted. We planted 8 new varieties of plums and more sweet and tart cherry trees, to make up for the ones that the deer destroyed this winter. This week’s nasty weather reminded us to talk about parking at our farm market, as we watched customers fight against the wind and rain from the parking lot to our market. In situations like this, or when you have a sleeping baby in the car, or when you feel like you just can’t make the trek up the hill, you are always welcome to come park in the driveway closer to the market. We just ask that you watch for others, especially small children who might be playing in our yard. If you are able to make the trek up the hill (no charge for the great exercise) we really appreciate it as it keeps the lanes open for our customers who need to park closer. We have red handled baskets available at the market to carry your things back to the parking lot, and you can leave the basket there by the old hay rake when you leave. We also have disabled parking available along the west side of the market (marked with a sign) with access to a level walk way for wheelchairs. For anyone who needs a level place to walk into the market, feel free to drop them off and pick them up there. Bottom line—-we know that parking here can be challenging at times, the most important thing to us is everyone’s safety and ability to comfortably get into our market. So with everyone’s help and flexibility—we think we can achieve that. Thanks for everyone for buying local. We hope to see you at the farm soon!